A high-contrast, black-and-white image of your bones is an effective tool for spotting fractures or breaks. 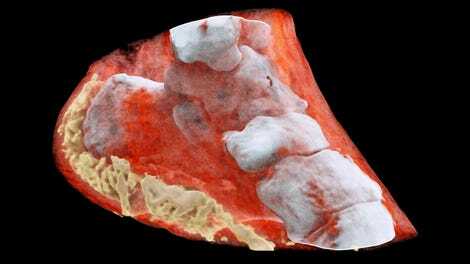 But after 120+ years, x-ray imaging is getting a remarkable update with 3D, full-colour images that reveal far more than just the bones inside you. These images will improve what a doctor can diagnose without cutting you open. The traditional approach to imaging the insides of a patient involves blasting them with x-rays. This electromagnetic radiation has a shorter wavelength than visible light, so it can easily pass through soft tissue, but it has more trouble passing through harder materials like bones. On the other side of your body, a sensor, or film, produces an image based on the intensity of the x-rays that make it through, thus revealing what’s inside you. A New Zealand company called Mars Bioimaging has developed a new type of medical imaging scanner that works in a similar fashion, but borrows technology developed for the Large Hadron Collider at CERN to produce far more detailed results. The Medipix3 chip works similar to the sensor in your digital camera, but it detects and counts the particles hitting each pixel when a shutter opens. When used in the new scanner developed by father and son scientists Phil and Anthony Butler from the Universities of Canterbury and Otago in New Zealand, the Medipix3 chip, enhanced with custom data-processing algorithms, can detect the change in wavelengths as x-rays pass through different materials in the body. This allows the scanner to differentiate bone, muscle, fat, liquids, and all the other material in the human body, while additional software uses that data to produce stunning full-colour images that allow a three-dimensional view of the inside of the body. So while a doctor is examining images of your arm, looking for signs of a break or fracture after a nasty fall, he or she could also look for other potentially dangerous medical conditions that might not be apparent in typical x-ray results. In fact, smaller test versions of this scanner are already being used to study cancer, as well as bone and joint health in patients – but the technology will be useful in countless other medical fields as well, from dentistry to brain surgery.